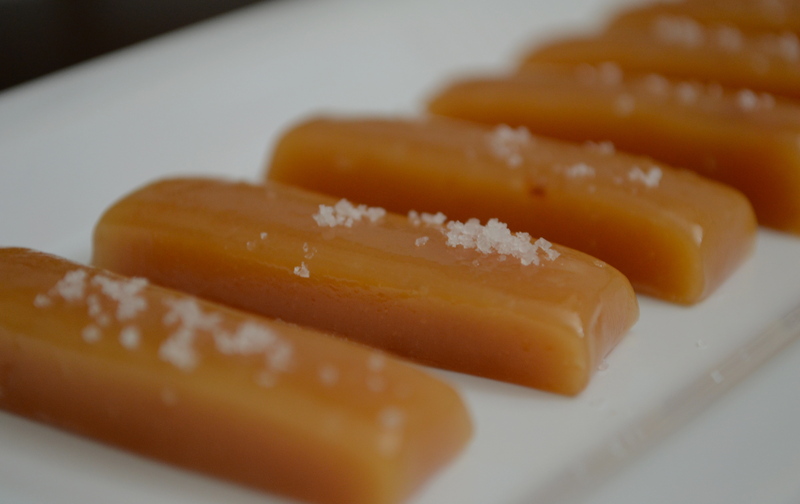 At last I have finished my recipe for the salted honey caramels, an adaptation of Amanda Hesser’s salted butter caramels, from the The Essential New York Times Cookbook. I started making caramels at Christmastime in 2010, cooking batch after batch until I found the perfect recipe, vetting several well known recipes along the way. Hesser’s salted butter caramels were damned near perfect, and with a few of my own tweaks, I think they are divine. Their richness is balanced by a delicate honey flavor, which is intensified by the addition of fleur de sel. In the end, the caramels are sweet and savory, and can be cooked up and wrapped in less time than it takes to make and frost a batch of sugar cookies. When wrapped they make great gifts, and I have yet to send them to someone who wasn’t grateful to open a package filled with chewy, salty caramels. The recipe, however, is only half the equation of making the perfect caramel. A pot of caramelizing cream and sugar has to be babysat like a toddler who can open a prescription bottle. That isn’t to say that the process is difficult, it just takes careful observation until you know what you’re doing and what to expect. Key to this process is having all your ingredients measured and ready before you turn on the burner. Scalding cream will not wait for you to measure out your sugar and honey, it will just burn. The second danger is not cooking your caramels long enough and ending up with spoon caramels, which are good for dipping apples in or pouring over popcorn, or in cooking the caramels too long and ending up with hard candies like a Werther’s Original. Again, they might taste great (if you can cut them), but it isn’t what you’re going for with this recipe. In order to avert these possible pitfalls (all of which I have made), you should have a good candy thermometer, properly calibrated so you know when your candy has reached the perfect consistency, which I’ve found to be 260°. I’m the kind of girl who likes to use a back-up method, so I keep a shallow dish of ice cold water in the fridge so I can also test the caramels to make sure they are at firm ball stage* when the thermometer says they are ready. I brought these caramels to a food swap yesterday, sponsored by the Shoreline Slow Food group, and traded them for some other sweet treats. 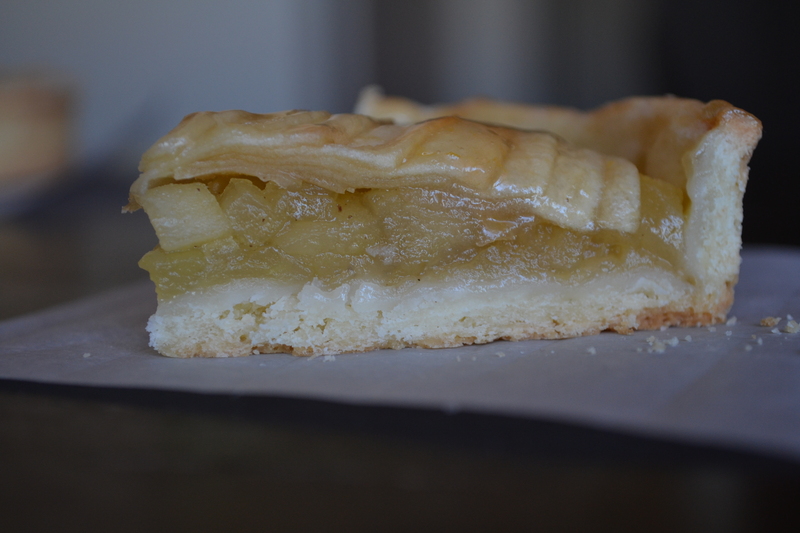 I walked away with a gorgeous apple tart made by a woman who was professionally trained as a French pastry chef. It was so beautiful it seemed like a crime to cut into it and eat it. However, after tasting it I decided it would have been a much graver crime to look at it only and not taste it. 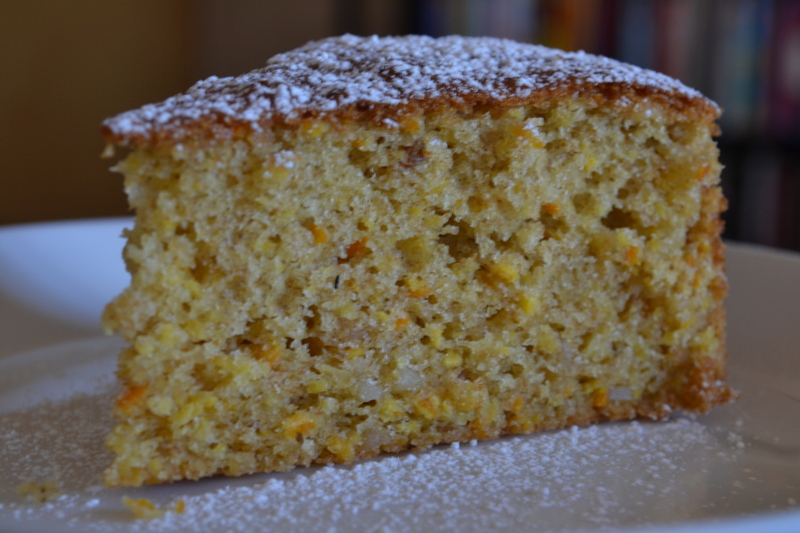 In addition to the tart, I also scored a moist, delicate olive oil cake with citrus and almonds. Last night Eli, my friend Emilie, and I debated over whether we would choose butter or olive oil if we could only have one. Without hesitating, Eli vowed his allegiance to butter, and Emilie followed suit, but I’m still undecided. It’s true that you’d miss out on a whole slew of pastries and cookies without butter, but I’m not sure I could live without crusty bread dipped in a pungent and zesty olive oil, sprinkled with fleur de sel. I’m glad I don’t actually have to choose. Before you begin to cook the caramels, measure out all of your ingredients. It does increase the amount of dishes you have to wash, but it will be well worth it when you don’t burn your candies. In addition, prepare the pan that you will pour your caramels into. I use a 10 x 10 inch pan, but this is an odd size. You could use an 8 x 8 inch pan, or two square-cornered (as opposed to the rounded corners you get with Pyrex baking pans) 9 1/4 x 5 1/4 inch loaf pans. Whichever pan you use, line it with aluminum foil and grease the inside of it with oil, cooking spray, or butter. Bring the cream to boil in a medium, heavy bottomed pan set on medium-high heat. 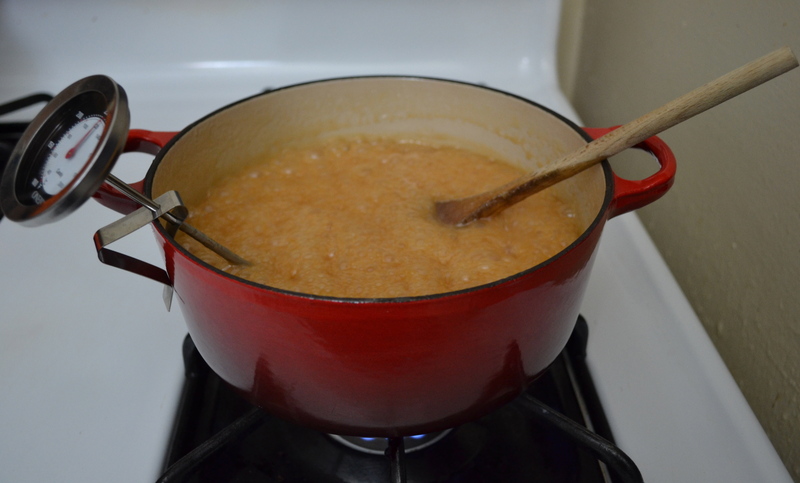 I use a 4 quart Le Creuset, which I call my caramel pot since it’s the perfect size. 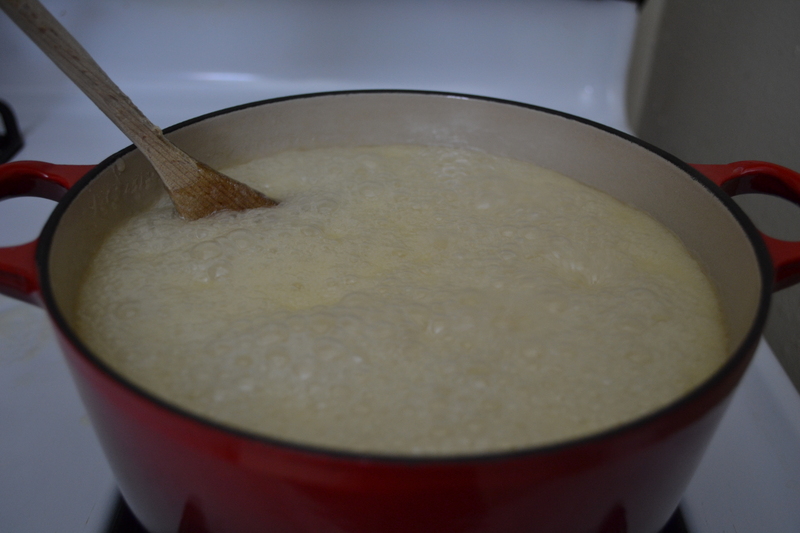 When the cream boils, add the sugar, honey, and corn syrup, stirring to incorporate. 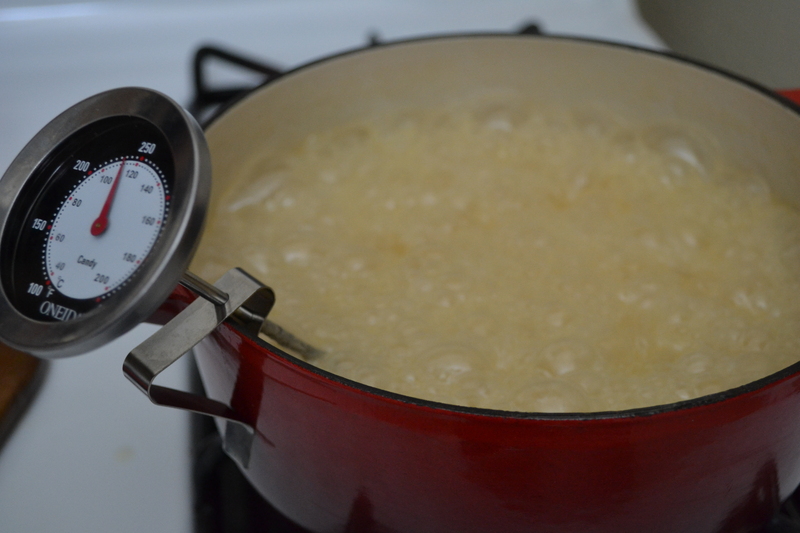 Bring the sugar-cream mixture back up to a boil and let it cook at a rolling boil, stirring regularly with a wooden spoon, until it reaches 260° on your candy thermometer, and is at firm ball stage. This takes me nearly 30 minutes on medium to medium-high, but may take you less time, so pay careful attention. I am always surprised at how fast it makes the leap from 250° to 260°. 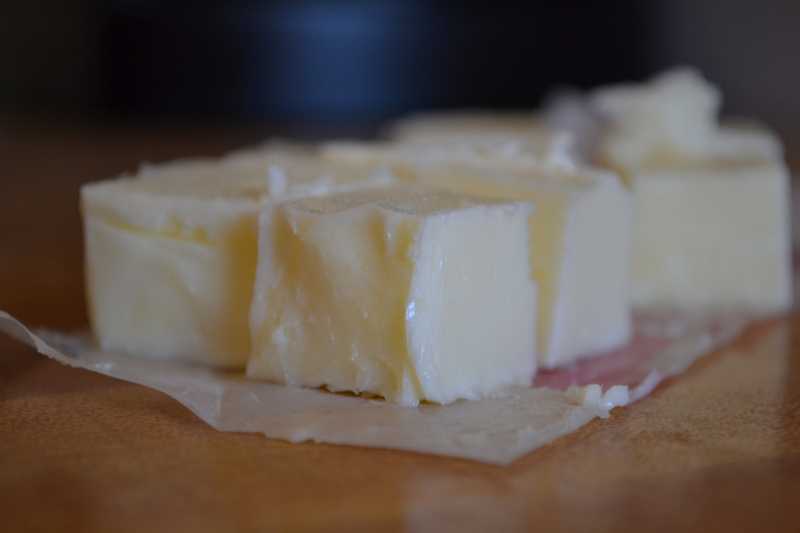 Remove the pan from the heat and stir in the cubed butter, vanilla, and 2 teaspoons of the salt. Pour the caramel into the foil-lined pan and let sit for about 10 minutes on a flat surface (otherwise it will set at a slant). 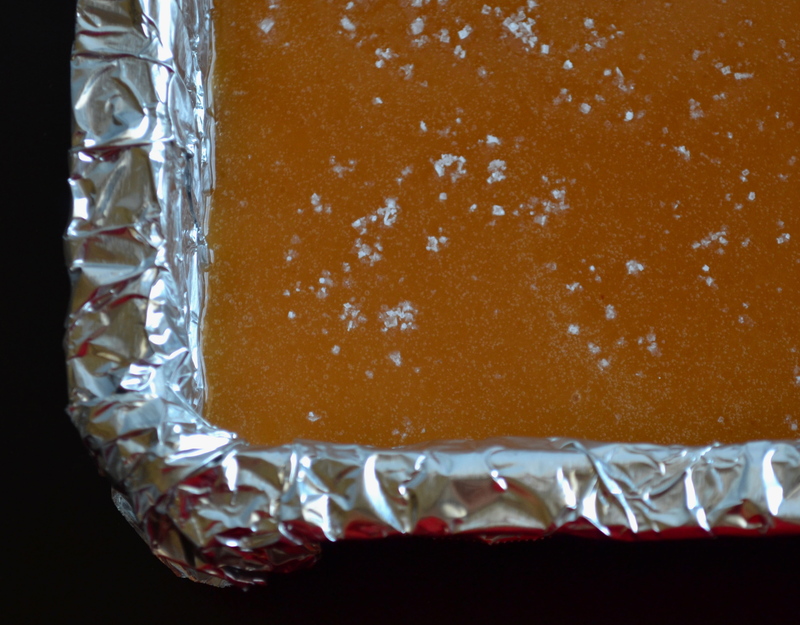 When it has cooled slightly, but before it is set, sprinkle the remaining fleur de sel over the caramel. After the caramels have set completely, which takes several hours of being set in a cool place, pull the edges of the foil out of the pan and turn the caramel out onto a large cutting board and remove the foil. Turn them right side up, so the salt is on the top, and cut into desired sizes using a large chef’s knife. To make the cutting easier, I cut the whole square in half and then work with one half at a time, cutting along the narrow edge. 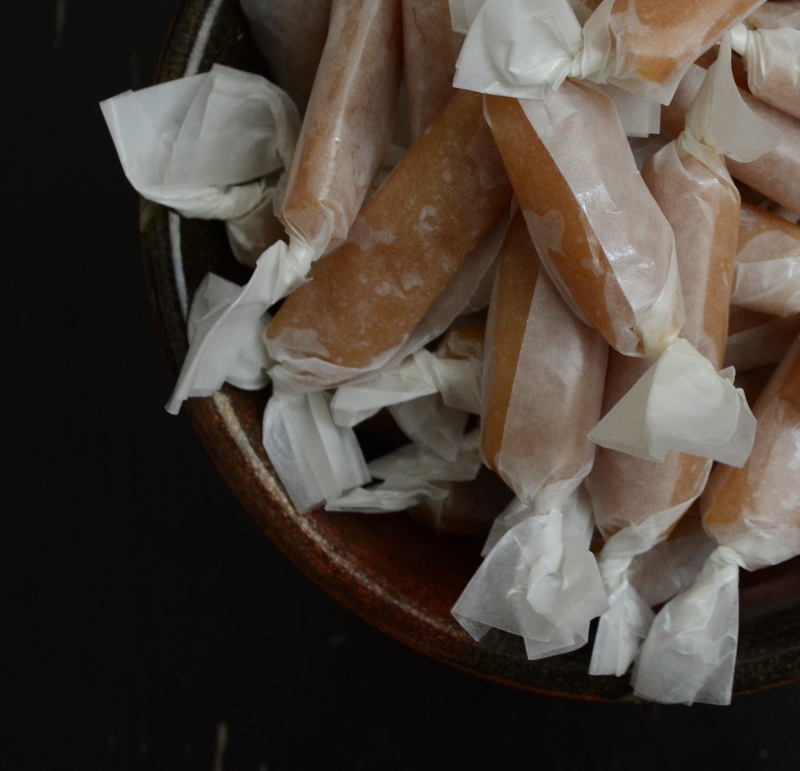 I cut my caramels into 1/2 inch x 1 1/2 – 2 inch pieces, and then wrap them in precut waxed papers. It takes longer to cut and wrap the caramels than it does to cook them, but I rarely have an opportunity to set out two pounds of cut caramels for people to eat, so I just pull up a stool and get to wrapping (spouses and children can be roped into this, too). Makes about 2 pounds. note: You can use the “cold water test” to assess the doneness of candy by instantly cooling the mixture to the temperature at which it will eventually set up if it stops cooking at that stage. Firm ball stage is reached when the caramels can be rolled into a firm but flexible ball when a small dollop is poured into ice cold water to cool, and then rolled between your fingers. Essentially, the caramel, when totally cooled by the ice water, should be the consistency you want them to be when you eat them. Recently, I tried out one of those “chocolate-cake-made-in-a-mug-in-the-microwave-in-two-minutes” recipes. The recipe called for one salted caramel to be dropped into the batter. Can I tell you how hard it was to find a store that had salted caramels in NYC? After Googling and going from store to store I finally found a large container of chocolate salted caramels at Whole Foods. After taking out a small loan with high interest I was in business. End of story? The cakes were really fun to make and the kids loved dropping the (very expensive) caramels in. I can’t wait to make your version. Thanks so much for the recipe! I hope you’ll try them, they are truly amazing. I tried dipping them in chocolate one time and it just totally adulterated them, however, chocolate cake with a caramel in it sounds very intriguing. Were they good? So happy you liked the tart. I can’t stop eating your caramels, they are my new favorite candy. Hope to see you at the next swap!